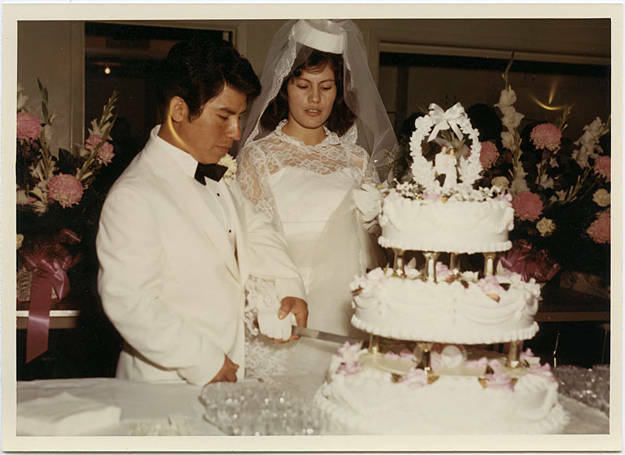 Color image of a bride and groom cutting a large, three-tiered wedding cake. She wears a white dress with lace overlay. A pillbox hat sits on top of her head and two veils, one of lace and one of chiffon, descend from it. The groom wears a white tuxedo with a black bow tie. Arrangements of white gladiolas and pink carnations dominate the tables behind the couple. This image is part of the Herbert McMullen bequest. McMullen was a local photographer who owned a studio in Hillsboro; he also collected images of local life taken by other photographers.